(SSC) Cannonball, ND — Over 300 police officers in riot gear, 8 ATVs, 5 armored vehicles, 2 helicopters, and numerous military-grade humvees showed up north of the newly formed frontline camp just east of Highway 1806. The 1851 Treaty Camp was set up this past Sunday directly in the path of the pipeline, on land recently purchased by DAPL. Today this camp, a reclamation of unceded Dakota territory affirmed as part of the Standing Rock Reservation in the Ft. Laramie Treaty of 1851, was violently cleared. Both blockades established this past weekend to enable that occupation were also cleared. In addition to pepper spray and percussion grenades, shotguns were fired into the crowd with less lethal ammunition and a sound cannon was used (see images below). At least one person was tased and the barbed hook lodged in his face, just outside his eye. Another was hit in the face by a rubber bullet. 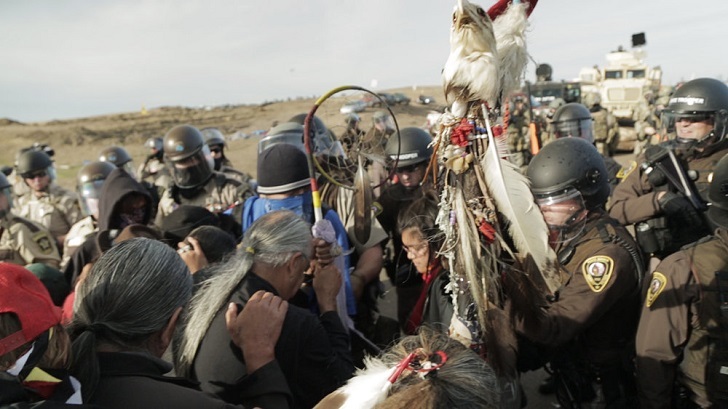 A prayer circle of elders, including several women, was interrupted and all were arrested for standing peacefully on the public road. A tipi was erected in the road and was recklessly dismantled, despite promises from law enforcement that they would merely mark the tipi with a yellow ribbon and ask its owners to retrieve it. A group of water protectors was also dragged out of a ceremony in a sweat lodge erected in the path of the pipeline, wearing minimal clothing, thrown to the ground, and arrested. A member of the International Indigenous Youth Council (IIYC) that had her wrist broken during a mass-arrest on October 22nd was hurt again after an officer gripped her visibly injured wrist and twisted it during an attempted arrest. At least six other members of the youth council verified that they had been maced up to five times and were also shot and hit with bean bags. In addition to being assaulted, an altar item and sacred staff was wrenched from the hands of an IIYC member by police. Several other sacred items were reported stolen, including a canupa (sacred tobacco pipe). Two medics giving aid at front line were hit with batons and thrown off the car they were sitting on. Then police grabbed another medic, who was driving the car, out of the driver side while it was still in motion. Another water protector had to jump into the car to stop it from hitting other people. Members of the horse nation herded around 100 buffalo from the west and southwest of the Cannonball Ranch onto the DAPL easement. One rider was reportedly hit with up to four rubber bullets his horse was reported to be hit in the legs by live rounds. Another horse was shot and did not survive. A confirmed DAPL private security guard was spotted among the protectors with an automatic rifle heading towards camp. Water protectors acted swiftly to stop the man who was attempting to flee the scene in his pickup. One protector stopped the assailant’s vehicle with their own before the security guard fled to nearby waters, weapon in hand. Bureau of Indian Affairs police arrived on scene and apprehended him. Three water protectors locked themselves to a truck in the middle of the road and surrounded it with large logs. After several hours of standoff, the police advanced in a sweep line and moved people approximately 1 mile back down the highway towards the main encampment on the Cannonball River. Water protectors then retreated to the bridge over Highway 1806 and erected a large burning blockade that the police were unable to cross. Law enforcement from at least five states (North Dakota, South Dakota, Minnesota, Wyoming, Nebraska) were present today through EMAC, the Emergency Management Assistance Compact. This law was passed by the Bill Clinton administration and allows states to share law enforcement forces during emergencies. 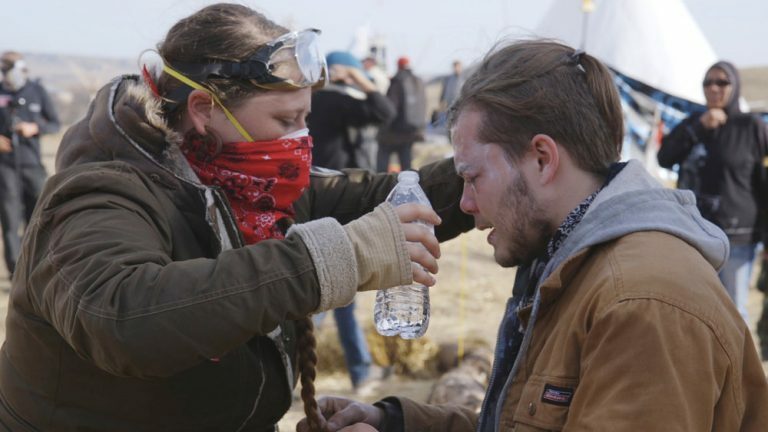 It is intended for natural disasters and has only been used twice for protests; once in the summer of 2015 during the demonstrations in Baltimore and here on the Standing Rock Reservation. Over 100 were arrested today in total. “My people stand for the water, and they attack us. My people stand up for the graves of our people, and they attack us. My people stand up for our sacred places, and they attack us. My people pray, and they stop us, dragging us from our prayer, and throw us in the dirt. I know this is America- this is the history of my people. America has always walked though the blood of my people. I appreciate that you are reporting what is actually happening. It seems somehow like an historical repeat. It was wrong then and it surely is wrong now. Not Native American, but praying WITH you. I am so saddened by this outrageous violation of citizens rights. I know enough history to know that the “invaders” (ENGLISH, mainly) introduced this type of aggretion to America. And many other areas of the world.